The refurbishment of the church and convent of San Marco was largely financed by Cosimo de' Medici and his brother Lorenzo, and began in 1436 with the restructuring of the dormitory and cloisters. Only two years later did the Medici finally succeed in purchasing from the Caponsacchi family patronage rights to the high altar in the church and in negotiating the relocation of several lay confraternities that owned the land north of the apse. (*2) Rebuilding efforts were transferred to the apse and choir of the church at that point, the expansion of which was finished in 1439. Construction at San Marco continued well into the following decade. Although the library was completed only in 1444, the church and convent were solemnly consecrated by Eugenius, accompanied by the principal members of the Roman Curia and the Florentine government, on the feast of Epiphany, January 6, 1443. 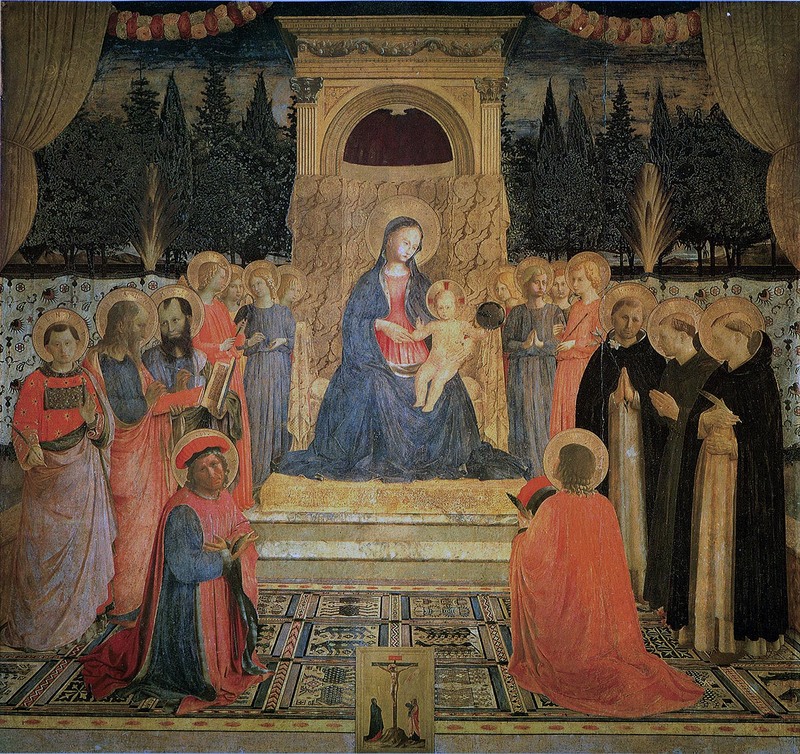 The painting installed above the high altar of San Marco when the Dominicans took possession of the church, Lorenzo di Niccolo's monumental Coronation of the Virgin, was removed in 1438 to facilitate construction in the apse and the choir chapel.The painting had become the property of Cosimo and Lorenzo de' Medici, with the purchase of patronage rights that year, and they promised it as a gift to the Dominicans of Cortona, where they delivered it in 1440. (*3) It is reasonable to assume that the contemplation of bestowing such a gift implies that plans to replace it with a new painting were already formulated. It is even likely that a new high altarpiece had been projected fmm as early as 1436, although serious work on its design cannot have begun much, if at all, before 1438. Independent of its design, the precise period in which the new high altarpiece was executed remains a much-debated topic, with most scholars assuming the consecration of the church in January 1443 to be a terminus ante quem, and a majority arguing for the likelihood of its completion within the years 1438 to 1440. The entire chronology ofAngelico's work on the decorative complex at San Marco, including the painting for the high altar and the frescoes in the chapter house, cloister, dormitory corridors, and in the cells of the forty-three friars, lay brothers, and novices, remains unresolved.There is no a priori reason to assume that an altarpiece was the most urgently required liturgical furnishing for a new church or chapel, as Mass could be celebrated at any altar with or without a painting installed above it. Furthermore, the spatial innovations introduced by Angelico in the composition of the main panel of the high altarpiece and in most of its predella panels represent a decided break from his work in the 143os but form the basis of all his subsequent production. Consequently, while it is perhaps most prudent to opt for a date for the altarpiece between 1438 and 1442, in all likelihood the period of its execution comprised only the later part of that time span. 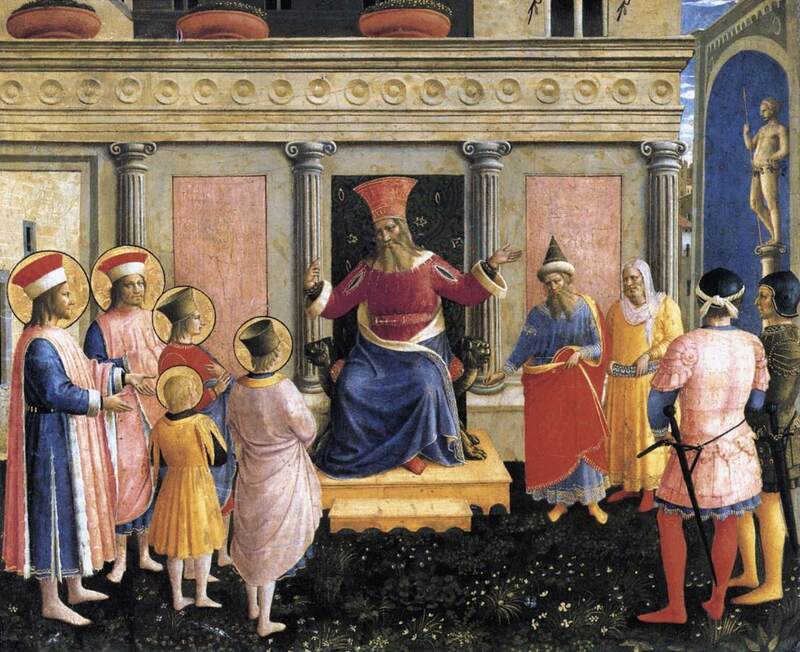 The subject assigned to Angelico for the San Marco high altarpiece was conventional: the Virgin and Child enthroned, with angels and saints in attendance around them. His solution to the assignment, however, was a radical departure from convention that was to become the prototype for nearly all Florentine altarpieces of this subject through the end of the fifteenth, and into the sixteenth, century. Instead of adopting the traditional Gothic polyptych format of, for example, the Guidalotti altarpiece in Perugia (cat. 30), Angelico composed, or was instructed to compose, his image within the large square picture field of the pala quadrata form favored by Brunelleschi for the altars in Santo Spirito and San Lorenzo. The open field of the painting (fig. 114) is organized architectonically around the central vertical of the Virgin's aedicular throne and the horizontal band of a patterned curtain extending over the full width of the panel, behind the standing saints and angels, and reminiscent of the cloth of gold drawn across the benches behind the figures in the Guidalotti altarpiece. Instead of the symbolic gold ground of that painting, however, the curtain in the San Marco high altarpiece is surmounted by a painted landscape of poplar and fir trees and a naturalistic blue sky, the whole closed off at the top by swagged garlands of roses and, at the upper corners, gold curtains painted as if they were suspended from the altarpiece's frame and had been pulled open to reveal the scene behind. The angels stand on the steps of the Virgin's throne as they do in the Perugia altarpiece, although in this case there are four on either side. An equal number of saints in the foreground, standing or kneeling on an elaborately patterned Anatolian carpet that covers the lower third of the composition, are ranked in converging diagonals leading back toward the throne and the objects of their veneration. The spatial ambitions of this monumental painting, still clear despite its severely damaged condition, are more farreaching than anything Angelico, or any other artist, had attempted before this, and the geometry he employed to achieve his goals is more rigorous and tightly controlled. This disciplined geometric order pervades the nine panels of the predella of the altarpiece as well. 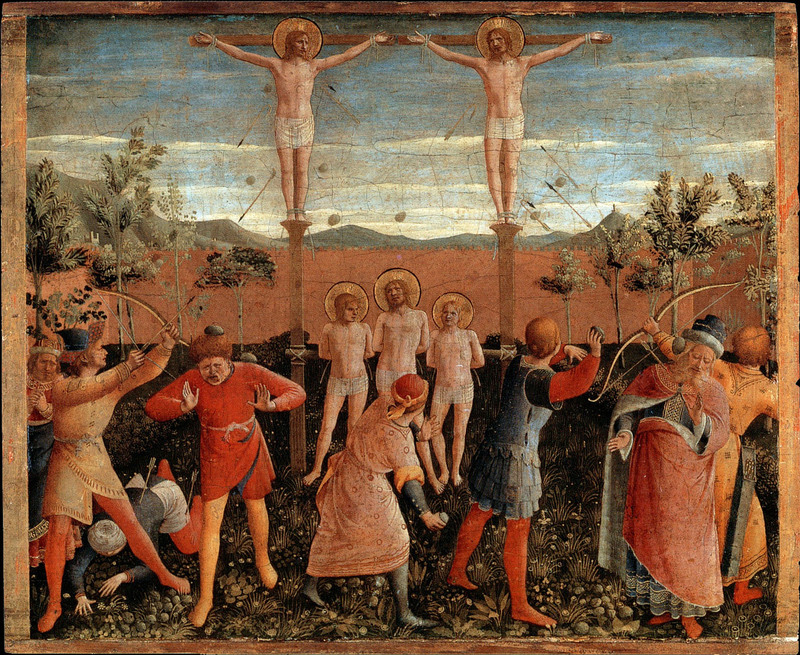 Now dispersed among collections in Florence, Munich, Dublin, Paris, and Washington, these panels illustrate eight scenes from the legend of Saints Cosmas and Damian — who, as patron saints of the Medici family, are shown kneeling prominently in the foreground of the altarpiece — surrounding an image of the Entombment of Christ. The latter scene (Alte Pinakothek, Munich, Inv. no. WAF 38a; fig. 115), one ofAngelico's most poetic creations, is uncompromising in the severity of its formal abstraction, casting an image that is both narrative and devotional into the same bilaterally symmetrical format as the composition of the main panel of the altarpiece once directly above it. The result is a triumph of design in which nothing of the emotional pathos inherent in this dramatic subject is sacrificed to artifice. Рис. 115. Фра Анжелико. Погребение Христа. The eight episodes from the legend of the third-century saints Cosmas and Damian, brothers and physicians, commenced on the outer face of the left framing pilaster with a scene of the miraculous healing of a woman named Palladia and with Palladia insisting that Damian accept the gift refused by Cosmas (G). The latter renounced his brother when he learned that Damian had taken Palladia's offering, and he swore that when they died they should not be buried together. The following night, in a divine vision, Cosmas was urged to reconcile with Damian. In the next scene (now in the Alte Pinakothek, Munich, Inv. no. WAF 36; fig. 116), originally situated perpendicular to the first one, at the left end on the front of the predella, Saints Cosmas and Damian, with their brothers, Antimus, Leontius, and Euprepius, stand before the proconsul Lycias. Рис. 116. Фра Анжелико. Святые Косьма и Дамиан перед проконсулом Лисием. For having refused to sacrifice to idols, Lycias orders them to be bound and thrown into the sea: this is shown in the background of the third scene (also now in Alte Pinakothek, Munich, Inv. no. WAF 37; fig. 117). Рис. 117. Фра Анжелико. Спасение святых Косьмы и Дамиана от утопления в море. Their rescue by an angel made Lycias resolve to convert to Christianity, but the pagan gods sent devils to slap him in the face, among other torments, for his infidelity; the saints prayed for his release and the devils flew off. In the fourth scene (H), Lycias repented and renounced his decision to convert, condemning Cosmas, Damian, and their brothers to be burned at the stake. 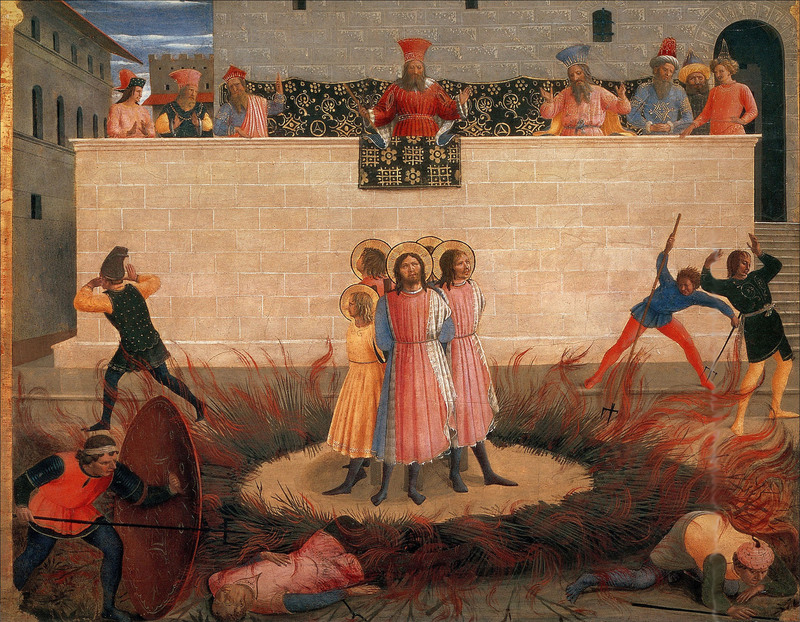 The saints, however, were spared the flames, and were left unharmed, and the executioners were burned instead. 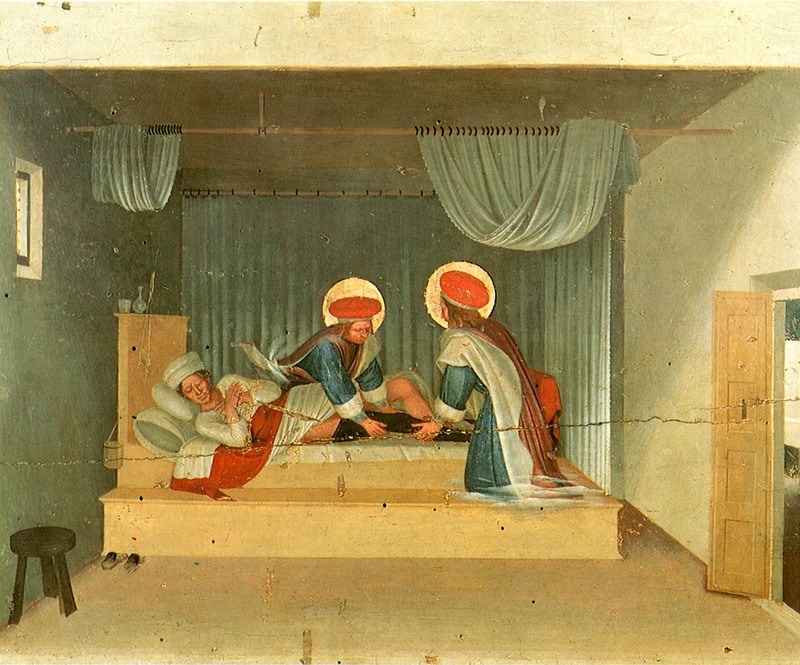 The legend of the saints continued to the right of the central Lamentation scene with another episode of attempted martyrdom (Alte Pinakothek, Munich, Inv. no. WAF 38; fig. 118) in which Lycias ordered Cosmas and Damian to be tied to crosses and their brothers thrown into prison. Рис. 118. Фра Анжелико. Распятие и побиение камнями святых Косьмы и Дамиана. When the people stoned the saints, however, the stones were turned back on their tormentors. In a rage, Lycias commanded that the three brothers be taken from prison and made to stand at the foot of the two crosses, whereupon his soldiers were to shoot arrows at all five of them, but, again, the arrows were turned back on the archers, and the saints remained unhurt. 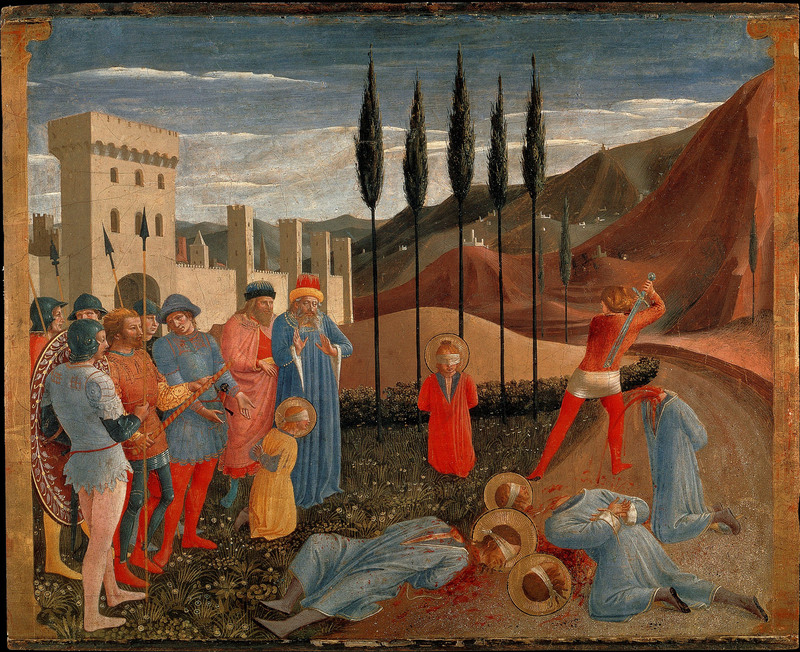 Lycias then ordered the beheading of all five brothers — the episode portrayed in the next scene of the predella (I). After the saints' martyrdom, their followers set out to bury them in accord with Cosmas's expressed wishes, resolving to ensure that his grave be separate from Damian's. In the next panel (Museo di San Marco, Florence, Inv. 1890, no. 8494; fig. 119), they are shown being stopped in their efforts by a camel, who, miraculously, speaks to them and reports that the brothers had reconciled and desired to be buried together. Рис. 119. Фра Анжелико. Погребение святых Косьмы и Дамиана. One of the saints' posthumous miracles was portrayed in the final scene of the predella, installed originally on the outside edge of the right framing pilaster and now in the Museo di San Marco, Florence (Inv. 1890, no. 8495; fig. 120), Justinian, a deacon of the church of Santi Cosma e Damiano in Rome, dreamt one night that the two saints appeared to him, applying ointments to his can-cerous leg and then replacing it with the leg of an Ethiopian from the cemetery of San Pietro in Vincoli; the following morning the vision was found to have been real. Рис. 120. Фра Анжелико. Исцеление Юстениана святыми Косьмой и Дамианом. In a marked departure from his earlier practice, as revealed by the Perugia (cat. 30) and Linaiuoli (cat. 29) predellas or the predella to the Louvre Coronation of the Virgin altarpiece, all of the compositions of the San Marco predella save one are oriented parallel to the picture planes and are either centralized (scenes 2, 4, 5, 6, 8, and 9) or carefully balanced from left to right (scenes 1 and 3). 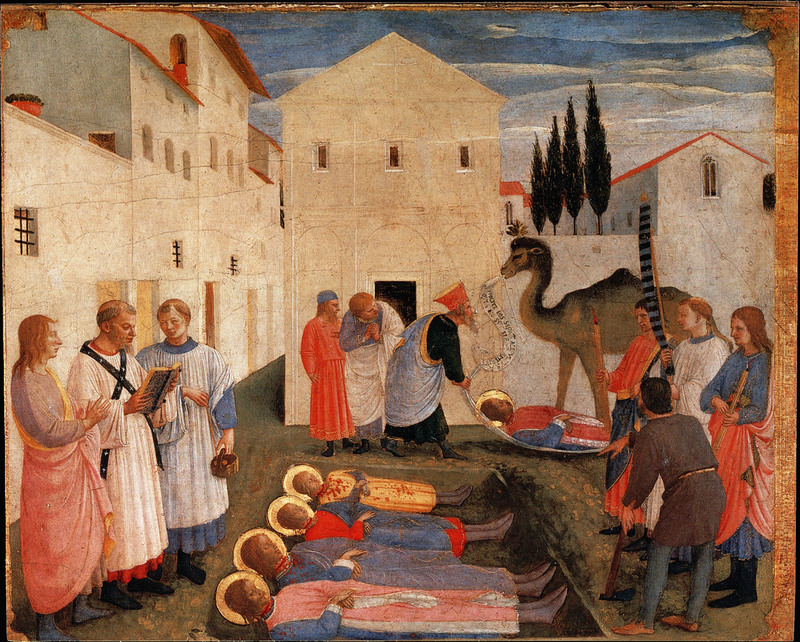 Only the Decapitation of Saints Cosmas and Damian (I), the seventh panel, reverts to a formula more familiar in Fra Angelico's earlier works: the narrative action is developed more dynamically along pronounced diagonals receding in depth, as though witnessed by a viewer entering the scene casually from one side. 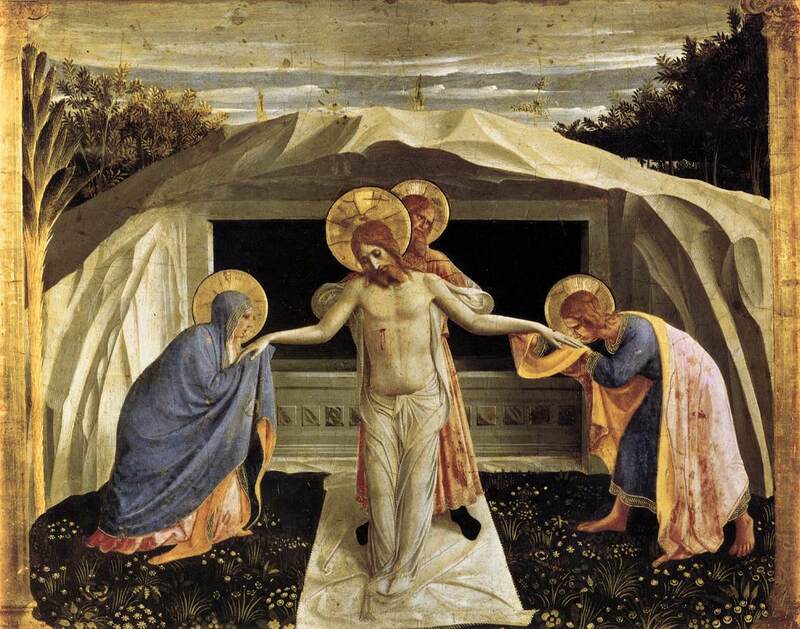 In all of the other panels, including the centrally placed Entombment, the setting is closed off by a carefully articulated architectural form (those in the first and last scenes are less detailed than the others) in front of which the figures are disposed along the orthogonals of a centrally foreshortened cube of space. Some of the compositions introduce diagonally positioned architectural forms intruding at the margins, but these do not materially alter the essentially planar organization of each scene except in the case of the third panel, where the demands of a continuous narrative required the artist to open out the landscape at the left to allow two further moments in the story to be incorporated into the middle distance and background.The novelty and sophistication of this approach may best be underscored by comparing the compositions of these predella scenes to their inept transcriptions, painted, apparently, by Zanobi Strozzi, on the predella to the slightly later Annalena altarpiece (now in the Museo di San Marco),(*4) where none of the subtleties of Angelico's geometric abstractions have been either understood or retained. Only in Angelico's own later compositions for the Annunziata Silver Chest and for the San Marco and Cappella Niccolina frescoes were these principles of spatial and compositional organization realized with an even more rigorous degree of consistency. Completing the San Marco altarpiece at either side of the main panel were massive buttressing pilasters decorated with standing figures of saints, similar to those included in Angelico's earlier altarpieces in the Guidalotti chapel in Perugia (cat. 30) and in the sacristy of Santa Trinita in Florence (fig. 53). Six of these figures — Saints Romuald,(*5) Thomas Aquinas,(*6) Anthony Abbot, Roch, Benedict, and Jerome (A–F) — are known to survive, although there once may have been as many as twelve. In a recent reconstruction by Miklos Boskovits,(*7) these six figures were arranged in two columns, with Saints Benedict, Jerome, and Romuald on the left of the main panel and Saints Roch, Thomas Aquinas, and Anthony Abbot on the right. Such an arrangement is perhaps suggested by the poses of the figures but not by their lighting. In the main panel of the altarpiece and in all seven predella scenes that originally occupied its front face, the light consistently enters from the right, while in the first and last predella scenes — those that have been plausibly situated on the outer faces of the framing pilasters — the light source is at the left. Three of the figures of saints — Benedict, Jerome, and Romuald — are also lit from the left, and it would follow that they must have occupied the outer face of a pilaster. Romuald, who faces right, was probably painted on the left pilaster, while Benedict and Jerome, who are both portrayed frontally, could have appeared on either side of the altarpiece.The other three saints — Roch, Thomas Aquinas, and Anthony Abbot—are all lit from the right and turn slightly to their left; it therefore is possible that they were situated on the front of the right pilaster. (*1). 1. Morcay 1913, p. 7; Hood 1993, p. 30. (*2). Hood 1993, p. 33. (*3). Libreria del Seminario, Cortona, Libro di Ricordanze di Frate Giovanni Tommaso Minerbetti, San Domenico di Cortona, 1703: "Cosimo e Lorenzo Medici ad insistanza di S. Antonino, donano a questo convento un quadro in Tavole, сhe e quello сhe sta nella facciata al Coro ebbe levato di San Marco, come si vede nelle ricordanze di questo Convento in Firenze"; reprinted in Cole 1977, vol. II, p. 612. (*4). 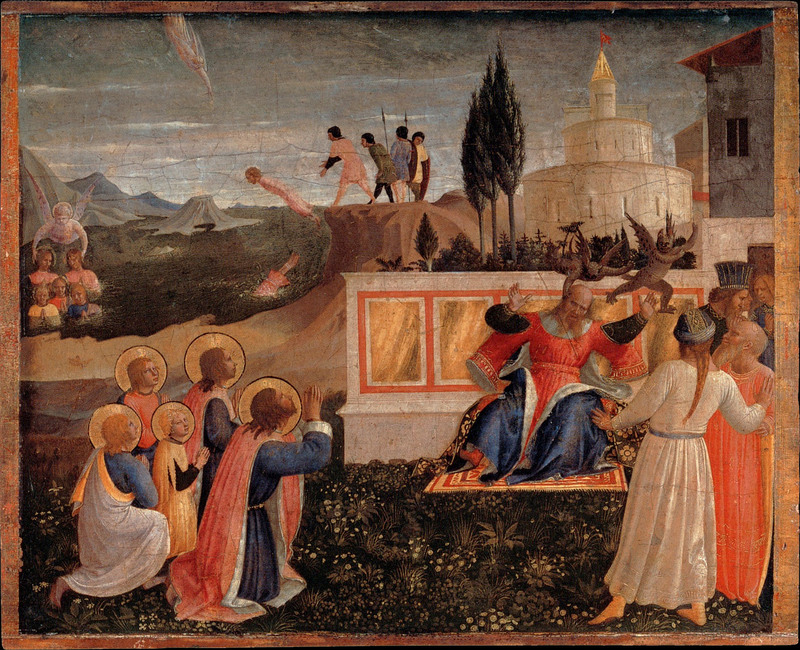 Although this altarpiece is frequently dated to the early 1430s, especially in the more recent literature on Fra Angelico, Pope-Hennessy (1974, p. 211) was correct to observe that its predella scenes cannot precede those of the San Marco high altarpiece. 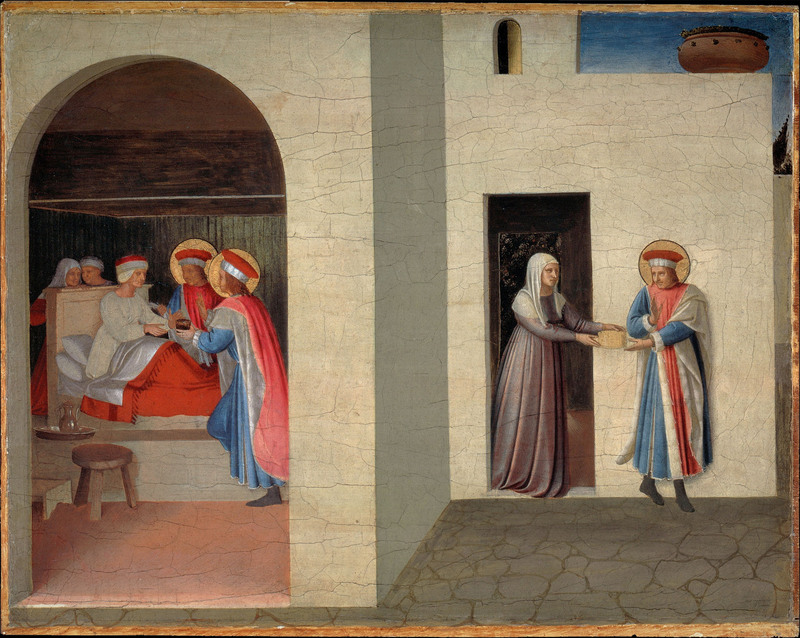 Difficulties in dating this work have arisen in large measure because it is not generally recognized to have been painted entirely by an assistant, probably Zanobi Strozzi, over a design by Fra Angelico.The relationship of its architectural backdrop to details incorporated in the Cappella Niccolina frescoes and in the Bosco ai Frati altarpiece suggests the likelihood that it dates after 1448-49, the year of Angelico's return to Florence from Rome. During this period, the services of Benozzo Gozzoli, who is documented at Orvieto and Montefalco, were unavailable to Angelico. (*5). This panel, first published by R. Oertel (1961), usually is referred to as an image of Saint Benedict, whose attributes are also a book and a birch rod; however, the saint in Altenburg (E), who bears these attributes and wears a gray habit, is clearly a representation of Benedict. Romuald, the founder of the Camaldolese order, is identified by his white habit. (*6). This panel was incorrectly noted by J. Spike (1996) and by all subsequent scholars as formerly in a private collection in Italy and later (having been confused with C) in a private collection in Lake Bluff, Illinois; the present painting had already entered the Cini collection by the 1950s. (*7). M. Boskovits (in Boskovits and Brown 2003, p. 17) argues that the pilasters must have contained four figures each rather than three, and four more on their outer, lateral faces, for a total of sixteen. Boskovits appears to have reconsidered his first proposal for recontructing the pilasters and to have arrived at a result largely in conformity with that suggested here (cited by A. Labriola, in Boskovits 2005, p. 50). Part of this reconstruction was recently confirmed by Holger Manzke, in a paper delivered on May 21, 2005, in which he demonstrated that the wood grain of the panels of Saint Benedict (E) and Saint Jerome (F) is continuous and that the Saint Benedict was situated at the bottom of its pilaster, while the Saint Roch (D) was painted on a different plank of wood.